I know someone, somewhere rather sagely once noted that all good things must come to an end, and while I appreciate the logical sentiment embodied in this, let’s be fair, rather obvious observation (no points for originality there buddy) and its universal truth, it still saddens me to think that of the things I love that will soon no longer be around and those that have already shuffled off this merciless chronological coil. One of the hardest things about this maxim is that it applies to my favourite TV shows which, if I had anything to do about it, would continue on and on and on to, and here I borrow liberally from Buzz Lightyear without shame, infinity and beyond! (much like the ad breaks which sandwich their eternally golden scenes). Saying goodbye to people you have come to know and love is hard; even more so when they’re scripted entities who don’t demand birthday gifts, late night phone calls and hand holding at important times in their lives (kidding: I love all that stuff … mostly) and who effortlessly amuse, inspire, freak out, delight you on a regular basis. 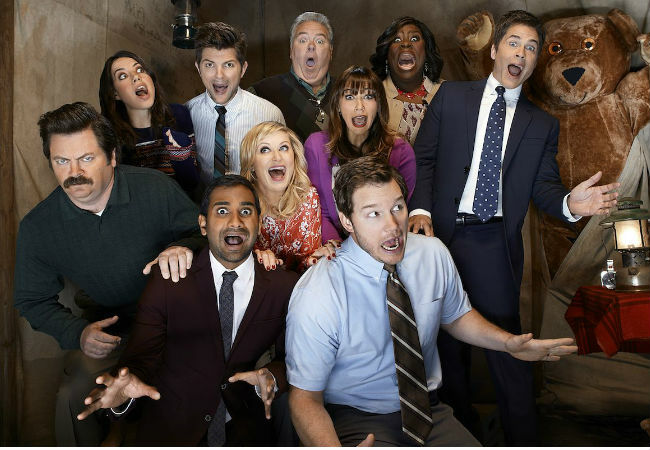 Even worse though than this final televisual goodbye is to simply have these characters disappear thanks to the flamboyant swirl of an accountant’s pen without the chance to properly farewell them; which is why the fact that one of my favourite sitcoms EVER, Parks and Recreation, is coming back for a 7th season (albeit one with just 13 episodes) fills my heart with L’il Sebastien levels of gladness. So lots to look forward to, and even better, until the show is back on our screens (no date specified that I can locate at this point), we have a season 6 blooper reel to keep us chortling away, waffles piled high before us, with L’il Sebastien back from the dead and reincarnated as all the characters (is there nothing he cannot do?! NO), slip-ups by all the actors and even an ad for Tom’s Bistro. Whoever it was in Old Navy’s marketing department that decided Amy Poehler should be the hilariously snarky face of their ad campaign should be a given a raise and a promotion, an all-expenses paid holiday to Australia so I can thank them personally, and yes, a whole new wardrobe naturally. It is quite simply an inspired decision. Whether she is channelling a spelling bee moderator, lawyer or sports coach (and yes a burrito server), she is never less than laugh-out-loud funny, and so persuasive about the merit of the brand she’s helping to advertise that I would quite happily jump on a plane just to buy their jeans (assuming I could stop laughing long enough to do that). You know assuming, of course, that the piece of clothing I wanted was “aggressive … dangerous … stupid” and was TOTALLY OK’d by Poehler’s black-clad arbiter of cool. Which naturally it would be. 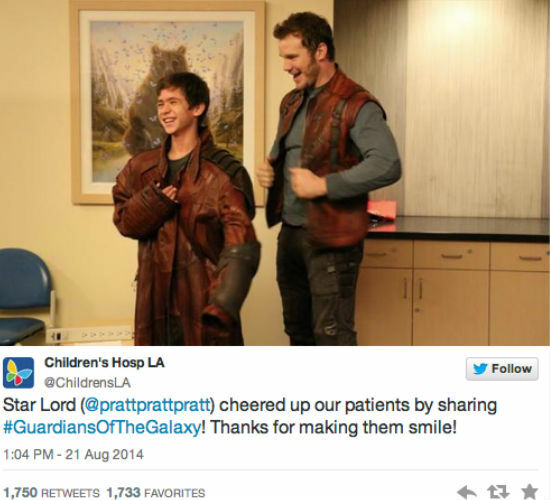 Fresh from saving the galaxy and channelling a pretty but dangerous purple Infinity Stone into the bargain, in Guardians of the Galaxy, the amazing Chris Pratt who can do wrong and is as adorable and down-to-earth sweet as they come, is now making the lives of sick kids just that little bit, OK a LOT, better. 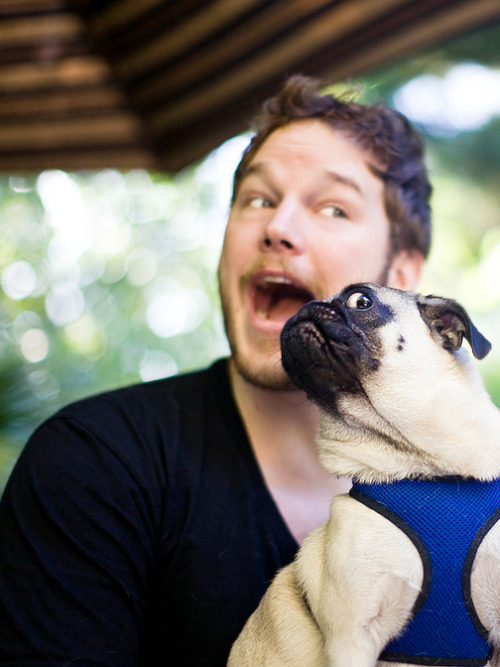 “We already knew Chris Pratt could rap, French braid, be hot, be hilarious, and be adorable with pugs. Oh and he looks awesome in a suit. When you’re in a need of a laugh, and let’s face it who isn’t at the moment what with the world currently going to hell in a rather bloodied hand basket, who better than Nick Offerman in full Ron Swanson mode to offer inspiring words of wisdom, drawn directly from Reddit’s inspirational Shower Thoughts, and recorded for posterity by Mashable. What makes all these pearls of practical wisdom, and wry observation all the more compelling, is that Shower Thoughts is raising money for Charity: Water, an innovative, transparent non-profit organisation with a mission to deliver clean water to as many communities worldwide as possible. If that’s not a good reason to get creative in the shower, and put your thoughts on Reddit to Nick Offerman can intone them in his most thoughtful poses, then I don’t know what is! Soap up people – Ron Swanson is waiting!